Wooden knees, wooden bikes, bikes on trikes, snow on trikes and Bosham bikes. 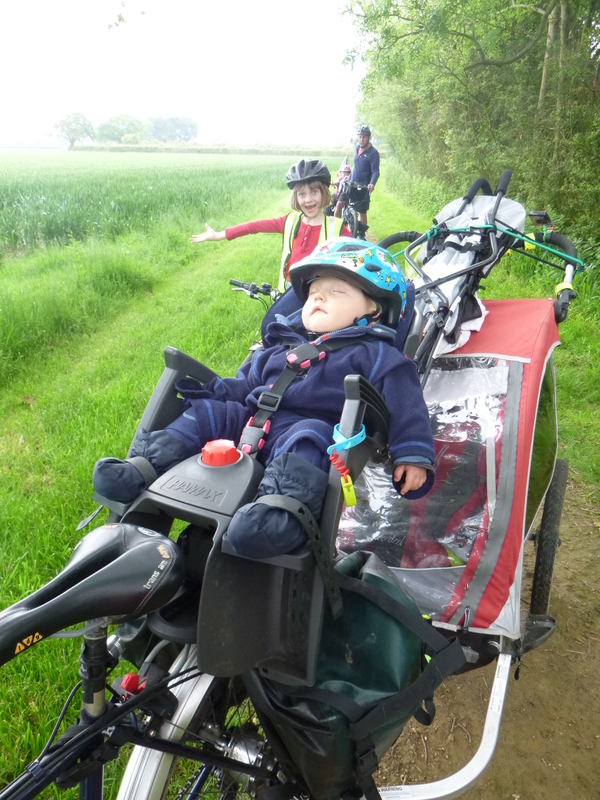 Have bike on trike will travel. One? morning I needed to bring Molly's bike home from school (after she had cycled there) as she was walking home in the afternoon with Gran. So into the Nihola contraption it went. I got a few strange looks cycling home. 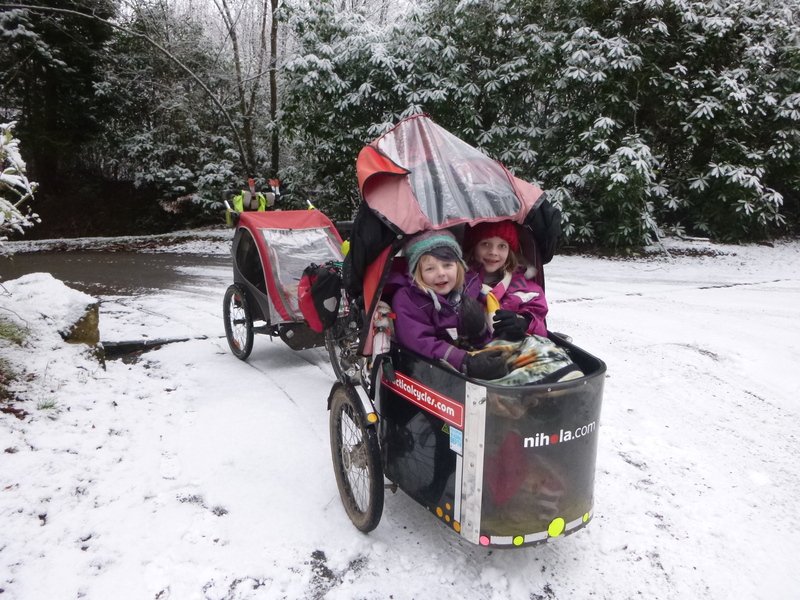 On the one morning that it snowed this year and the roads were too icy for Molly to cycle her own bike to school she sat in the box of the? 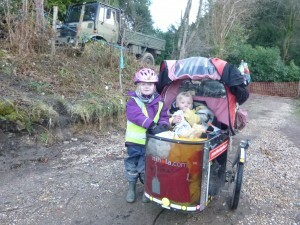 trike with Daisy. Cheeks were very rosy on arrival. On the road to school. 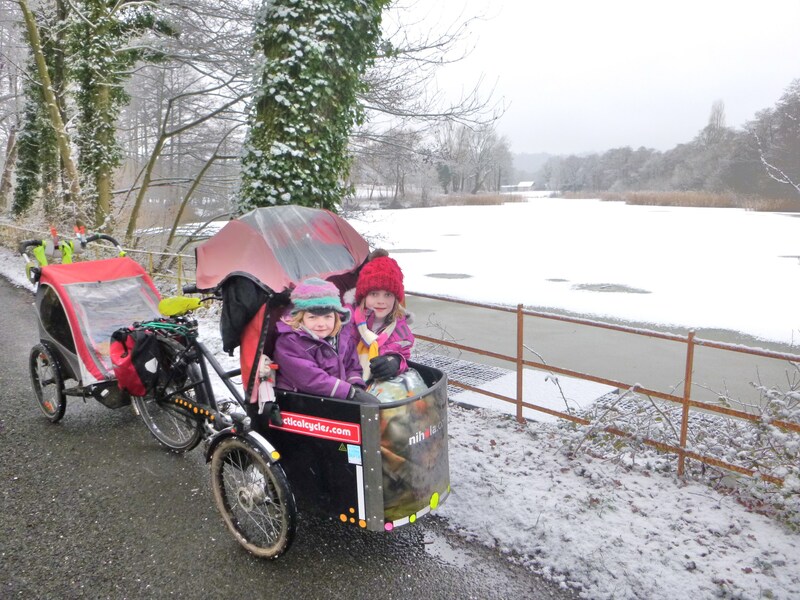 No need for a 4x4 to tackle the snow when you've got a 3x2. I just made it up the hill without having to eject my cargo. With the snow all gone? 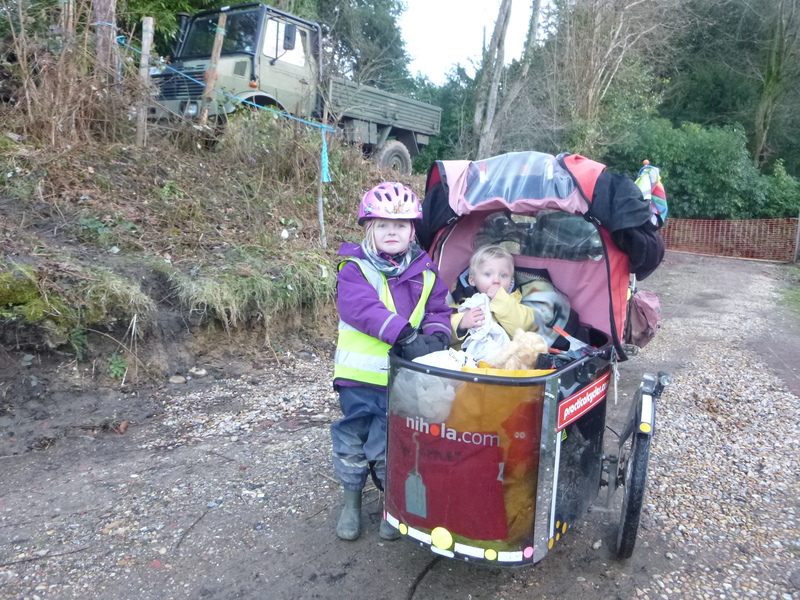 here's Jack in the box (with Daisy on sentry duty) demonstrating our little 3-wheeled run-around. Gary's slightly larger 4-wheeled one is up on the bank. 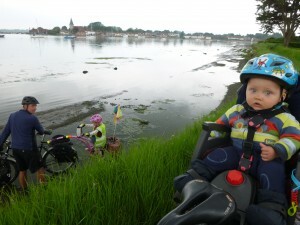 Long before it snowed we went cycling off to Bosham (west of Chichester, east of Portsmouth). 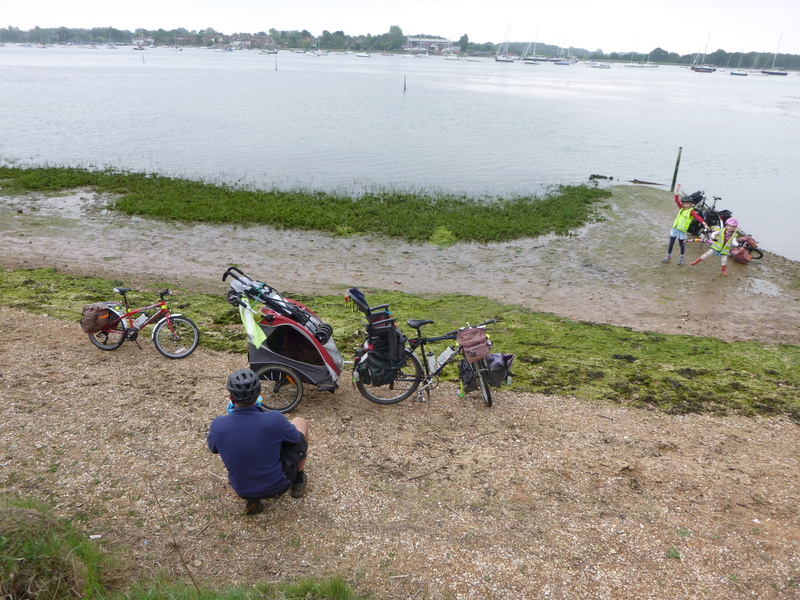 Here we are waiting for the small passenger ferry to Itchenor which mounts the beach to pick people up..
All aboard the Itchenor ferry. There was just room for us and the trailer and bikes, but not a lot else. 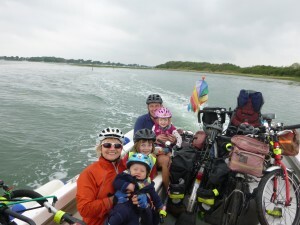 Once off the ferry we rode along the Salterns Way towards West Wittering. 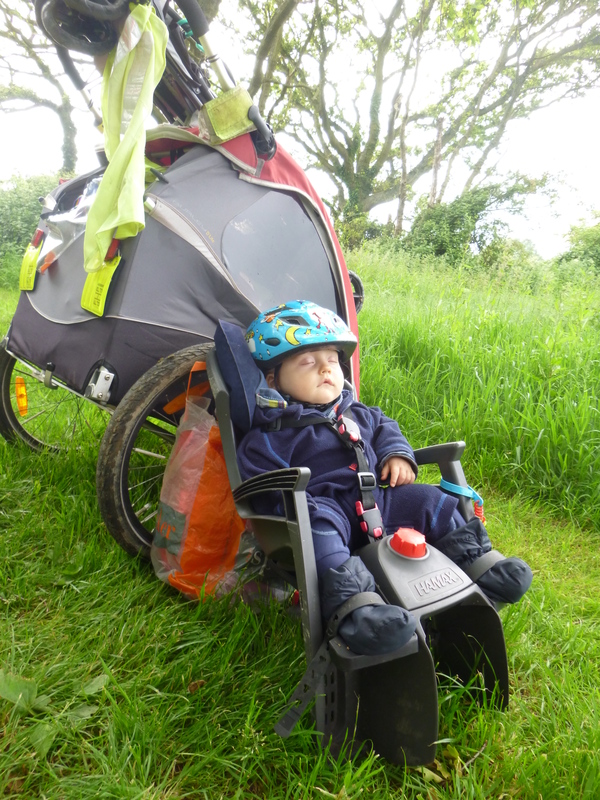 The excitement of the boat ride was too much for Jack and he passed out with weariness on the back of my bike. 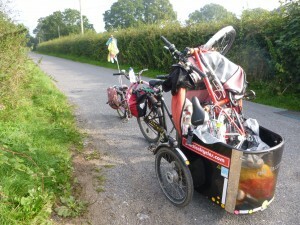 As there was nothing to lean my bike against on our picnic stop? I slid off the bike seat and propped it against the trailer. Jack slept through all the sliding and shunting, probably dreaming he was still on the ocean wave..
Jack getting an elevated view of Bosham harbour. 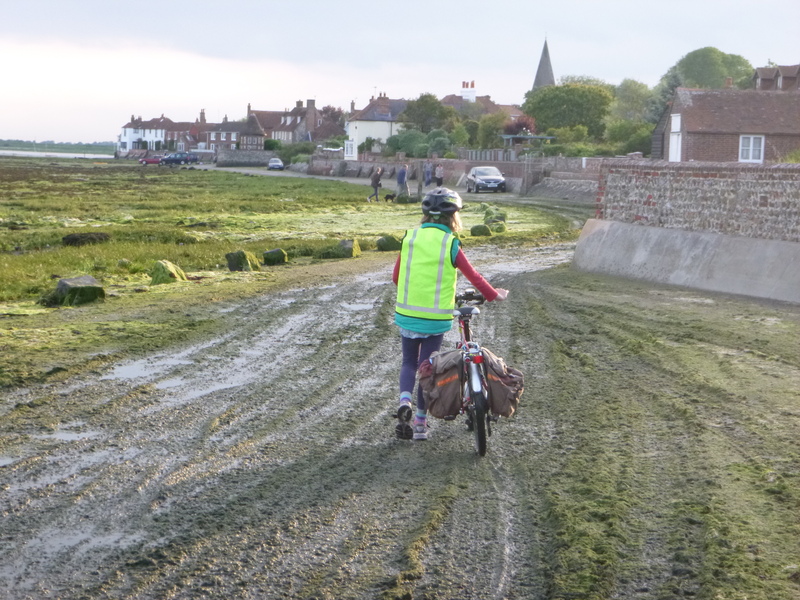 He took the high road (narrow muddy-grassy footpath) on the back of my bike while Gary and Daisy and Molly took the tide-washed seaweed-laced low road. 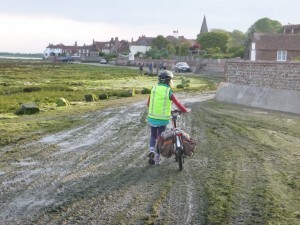 Molly pushing her bike along Bosham's? slippery and slimy seaweed-covered road - a road that spends half its life under water.. In the last few months Jack (who is now 1 and three quarters) has sprouted from baby to boy. 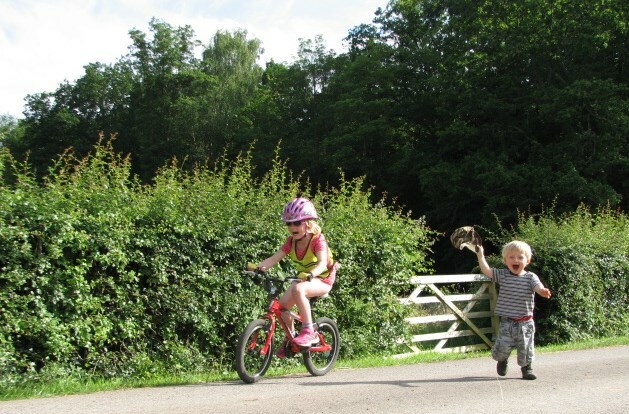 He’s always itching to take Daisy’s bike for a spin. Another foot of growth and he’ll be there. Jack running enthusiastically after Daisy hoping to knock her off so that he can have a go. 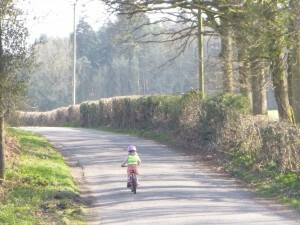 Daisy (who is 5 and an eighth) is keen to ride in the Tour de France. 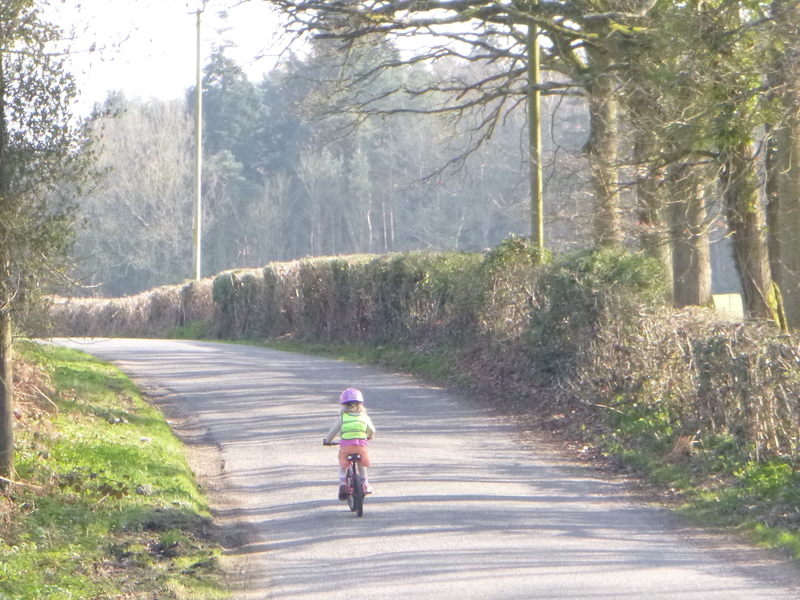 Here she's practising for speed on a local lane. 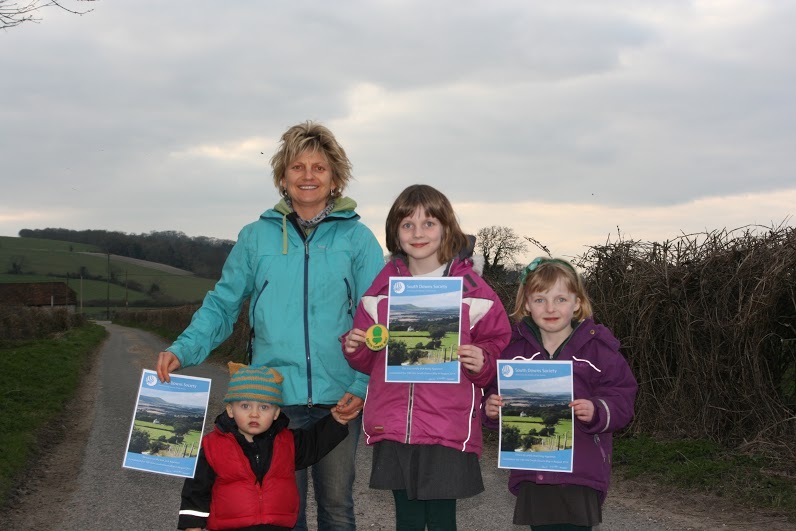 On the walking-pram-pushing front, the South Downs Society presented Jack, Molly and Daisy with certificates for walking the 100-mile South Downs Way last August (see last post for pram-pushing saga). After this last picture was taken my left knee went up the shoot. One minute it felt like a lovely knee and the next it refused to bend so I had to drag my leg around behind me like a wooden one. After weeks lolloping over hill and dale on crutches I was finally sent off to have a scan. I was told I had chondromalacia patellae, which sounded to me like some fancy pasta dish containing langoustines and pine nuts but which in fact roughly translates as bashed-about cartilage beneath my knee cap. My knee man said he could dive into my knee all guns blazing with arthroscope and scalpel in hand and carve and slice and chisel bits off or I could try a spot of physio. Not fancying having holes drilled into my knee I opted for the physio option even though the surgeon warned it may have no effect. But it did have an effect and after nearly 8 weeks and over 250 miles of crutching about the countryside (I crutched on average 5 miles a day) my knee started behaving like a flexible knee again and not a wooden leg. 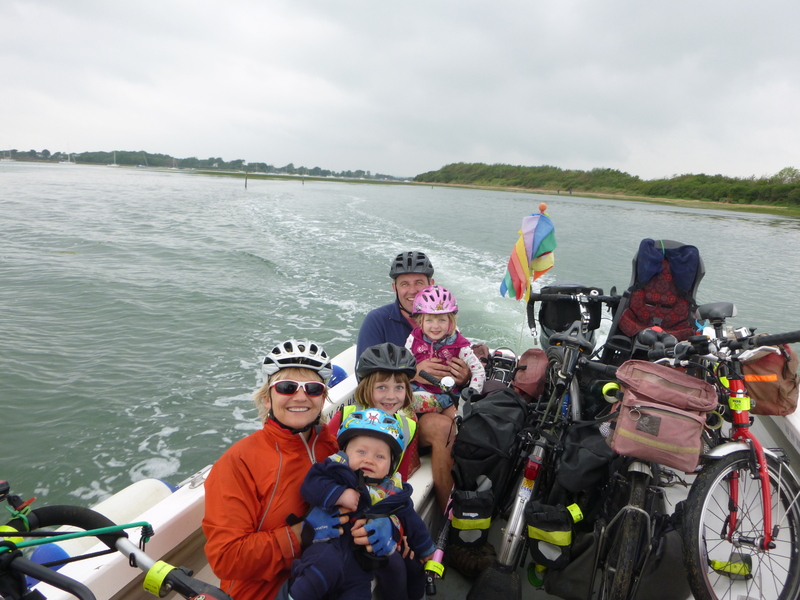 If it hadn’t got better I had been pondering the possibilities of of crutching from Land’s End to John o’ Groats as I thought it would be quite fun to swing across the Pennines and the Grampians and see Britain from the viewpoint of a crutch. But for now I’m back on my bike (Hallelujah!) and my crutching career will have to wait. 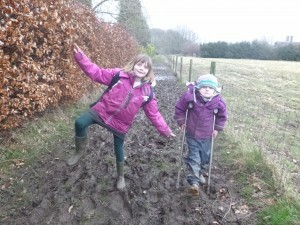 Daisy looking like an old man on my crutches with Molly on the boggy path on the way to school. During February and March our cycling school run turned into a crutching school run. 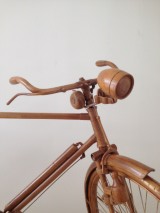 From wooden legs to wooden bikes. 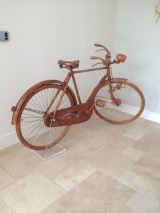 I've been sent an email from a man who has a wooden bike for sale. 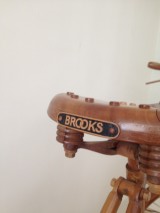 It's a full-size Raleigh bike made of walnut with a Brooks wooden saddle. It was made around 1970 by a cycling enthusiast and took an estimated 1000 hours to build. It's up for sale so if you have a spare ?8500 floating about your person let me know and I will put you in contact with the wooden bike owner man. Thank you! “23 Comments” was getting just too monotonous. I was on the verge of adding No.24 just for the change. Just happened to glance on my Bookmark list and gave you a hit, then realised it was a NEW post! Your little chap is really cute and your girls are mini-you. 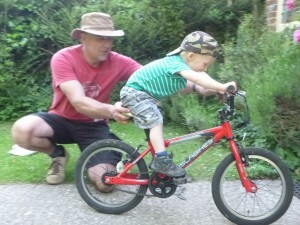 I now have a granddaughter, son’s left it a bit late as he’s – my God it’s 46 in August! Her name’s Pickle, graduating from Chicken. Real name Ellie Mai. I’m pleased your knee has improved. You could have got wheeled crutches though I’m sure. 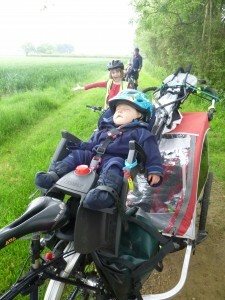 Lovely to hear from your Tribe again, and I can’t believe how Jack has grown! Pleased to know that your knee is improved and will again function as a knee is supposed to do. 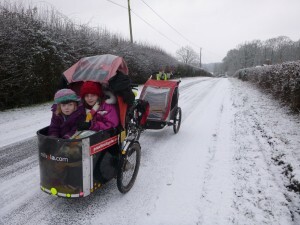 I currently have 2 friends riding about on the South Downs Way and it sounds as though they are having fun.We’re currently in really cold weather here in Oz and suffering sleepless nights what with Le Tour and the Ashes series(cricket, of course). “chondromalacia patellae” – my daughter had that when she was a teenager. Her knee was hurting and the doctor said it’s something teenagers get quite a lot and that it would probably just go away, which it did. Maybe it’s like chicken pox – if you get it when you’re older it’s worse…..Glad to hear you’re back on your bike!! Lovely to see your back. 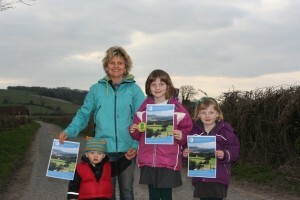 I was the crazy woman from Sidmouth.I still look with interest. You have a lovely family. I am now a widow and still walking . Frances.